Military families come in all shapes and sizes. They’re big, small, come with dual-military parents, single parents, and more than a few have their fair share of fur. Military pets, dogs especially, travel the world with their humans moving from one assignment to another. They watch their favorite people leave without knowing if they’ll come back, and they jump with joy when their long-lost family members finally walk through the door (military dog reunion videos, anyone?). Military dogs support spouses during long deployments, are loyal friends while kids switch schools (again), and their strong, supportive faces are important parts of every military community. USAA, the top financial services institute for military members, recognizes how much military families care for their pets. They offer full-coverage pet insurance, and they’re dedicated to making sure every dog gets the care they deserve. To better understand the family dynamic, USAA started asking military members all about their furriest friends. From senior dogs that have been through even more moves than the kids to new puppies training to be the best companions they can be, there are millions of military dogs living in the U.S. and overseas. USAA wanted to get to know their four-legged clients a little better, and they’ve tallied up which dog names are the most popular for military families. While you might think military dogs would be named things like Sergeant, Captain, or Colonel, or maybe something obviously patriotic like Justice or Liberty, it turns out military dogs have many of the same names as their civilian counterparts. The top military dog name happens to be the overall top female dog name according to Rover, and names like Luna and Max seem to be as popular with civilian families as they are with military members. USAA did find, however, there are quite a few military dog names that don’t show up on traditional lists. Chalk it up to a service member’s life experience or a military dog’s unique personality, but some of these military dog names might surprise you. Without further ado, here’s USAA’s list of the top 10 military dog names for 2018. Military families love their military dogs, and caring for pets while jumping the hurdles of life in the service is never easy. Despite every move, the endless paperwork, and the struggle to find pet-friendly homes every few years, dogs stick around through it all. 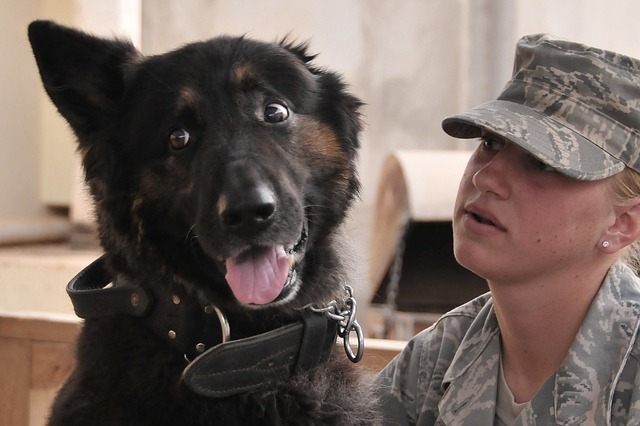 They’re loyal to a fault, and military dogs will always be a big part of the dog-loving community.